The Natural Resources Division provides opportunities for the public to access the water for fishing, crabbing, boating or beach combing. Water Trail Adventures in Calvert County, Maryland guide is available now. Guides will be available at sites throughout the county such as Kings Landing Park, Jefferson Patterson Park and Museum, Solomons Visitor Center, Solomons Boat Ramp, North Beach Welcome Center, Chesapeake Beach Town Hall, and Battle Creek Cypress Swamp Nature Center. Calvert County residents should call the Calvert County Natural Resources Division at 410-535-5327 if they would like a free copy mailed to them. The guide can be purchased ($3 to cover postage) from the DNR Outdoor Store at http://shopdnr.com/watertrails.aspx. NOTICE: Solomons Boat Ramp will reopen on or about March 15. Ramp fees may be charged. Solomons Boat Ramp and Fishing Pier, 14195 Solomons Island S Solomons. Ramp fee charged. Chesapeake Beach. 4075 Gordon Stinnett Ave, Chesapeake Beach, MD 20732. Ramp fee charged. Hallowing Point Boat Ramp. 6904 Hallowing Lane, Prince Frederick, MD 20678. No fees. NEW! Lower Marlboro Wharf 3955 Lower Marlboro Road, Owings. 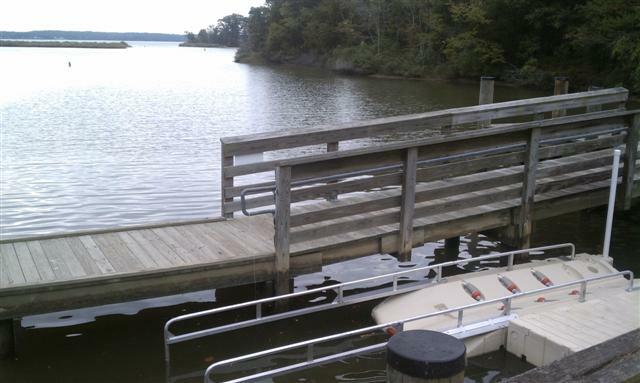 (direct access to Patuxent River, floating dock) Limited Parking. No fees. Solomons Boat Ramp and Fishing Pier, 14195 Solomons Island S, Solomons (direct access to Patuxent River, ramp) Ramp fee charged. North Beach 9023 Bay Avenue, North Beach, MD 20714. Rentals available. Beach fees may apply. Chesapeake Beach. 4075 Gordon Stinnett Ave, Chesapeake Beach, MD 20732. Rentals available. Ramp fee charged. Jefferson Patterson Park. 10515 Mackall Road, St. Leonard, MD 20685. Hallowing Point Boat Ramp. 6904 Hallowing Lane, Prince Frederick, MD 20678. A valid Maryland fishing license is required for fishing. Kings Landing Park, Huntingtown. No fees. Flag Ponds Nature Park, Lusby. Entrance fee charged. Lower Marlboro Wharf, 3955 Lower Marlboro Road, Lower Marlboro. No fees. Solomons Boat Ramp and Fishing Pier, 14195 Solomons Island S, Solomons. Fishing pier is free; ramp fee charged if launching a boat to fish. Nan's Cove, 8081 Broome's Island Road, Broomes Island. No fees. Navigation issues and waterways are managed by the State and the US Coast Guard.